Up Angled / Down Angled Figure 8 IEC 320 C7 to C8 Male to Female Power Adapter, Extender, Converter : allputer.com - Accessories for all your Portable Electronics & Computers! Now you can take a single mains cloverleaf lead and stick this on the end if you want to charge my camera. The same usage applies to all other gadgets. Makes your trip neat and easy. 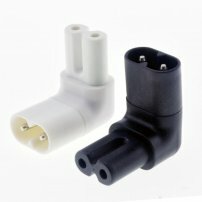 - This plug adapter does NOT transfer voltage, verify your device or power supply is within the output range before us or damage will occur!